August 4th 2017 was a historic day in football. In Paris, Neymar da Silva Santos Júnior was unveiled by Paris Saint Germain as the most expensive footballer in history, after completing a €222 million transfer from FC Barcelona. 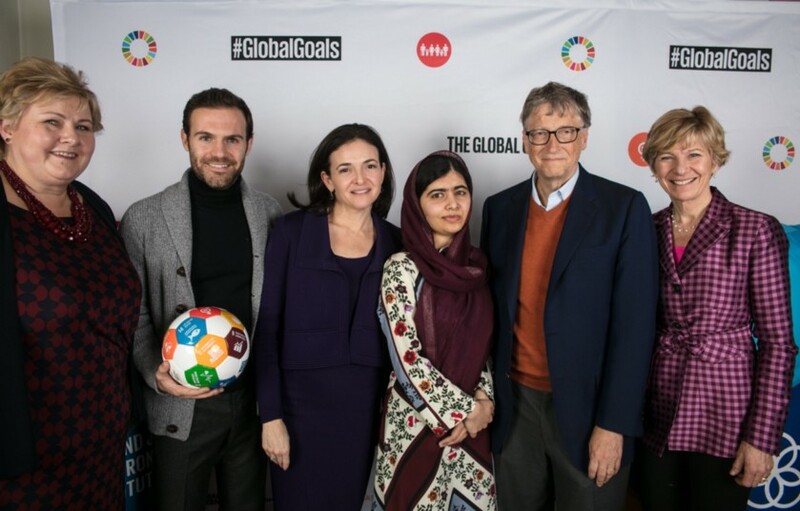 While 375 miles away in Manchester, Juan Mata announced that he would be the first player to join the Common Goal initiative, and called on his fellow players to unite and create positive, sustainable social impact through their influence as players. Both a commentary on the effect of money in the game. Both seismic moves in the industry that will forever shape the football landscape. 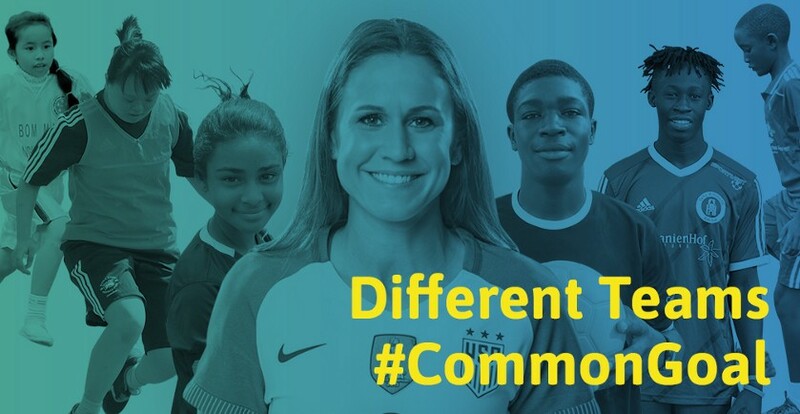 A year later, and Common Goal has begun to make its mark on the industry. The movement boasts over 50 players from leagues all over the world from the UK to China to the US and the Faroe Islands. Three managers, one football club, and the UEFA president have all taken the 1% pledge. And now, after launching a brand new digital hub, countless fans have joined their favourite players and joined the team by taking the pledge. All have committed to supporting organisations that are using football as a tool to champion social causes across the globe. The biggest achievement of our year was the chance to complete our first allocation of support to 27 football for good organisations and 2 signature projects across the globe. 40 of our players, from 19 countries, were able to give over $500,000 to organisations that use football to champion gender equality, education, health, and more. It was the first step we took in further strengthening the link between the world of professional football and the world of social development. Common Goal is a player-led movement. So every time a player takes the pledge, it’s an important milestone. And this year, we have seen players from all walks of life join the team. With 55 players, from 20 countries and 6 continents — we’re still working on securing a player from Antartica — the spread of the movement has surpassed expectations and shows no signs of slowing down. Over the past year, individuals have joined Common Goal for any number of reasons and all over the world. Some have been invited to join by their fellow footballers, most recently Icelandic international Frederik Schram who was inspired by his friend and international teammate Alex Rúnarsson. Others, like Giorgio Chiellini and Heather O’Reilly, joined unprompted. 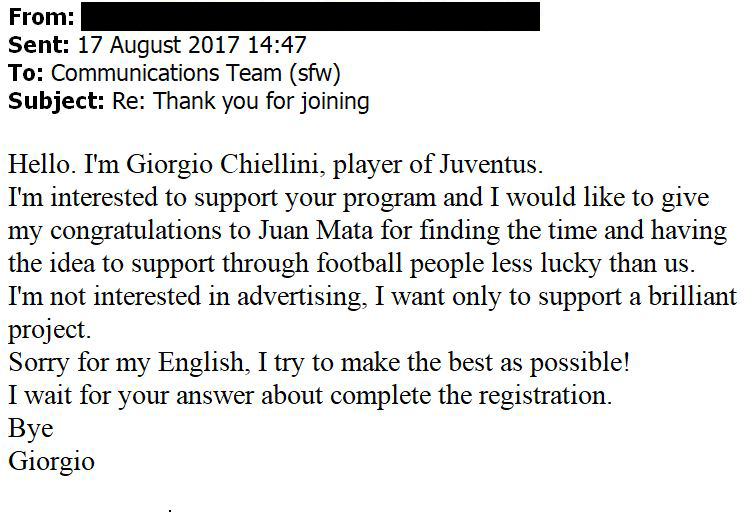 Giorgio was simply inspired by the initiative and the example being set by Juan Mata, so he sent a message to the general Common Goal email asking how he too could join the team. While Heather witnessed her fellow countrywomen, Megan Rapinoe and Alex Morgan, taking the pledge, and reached out to join the cause. Vero Boquete, a Spanish National Team player, represents Common Goal from China where she is currently playing in the Chinese Super League. 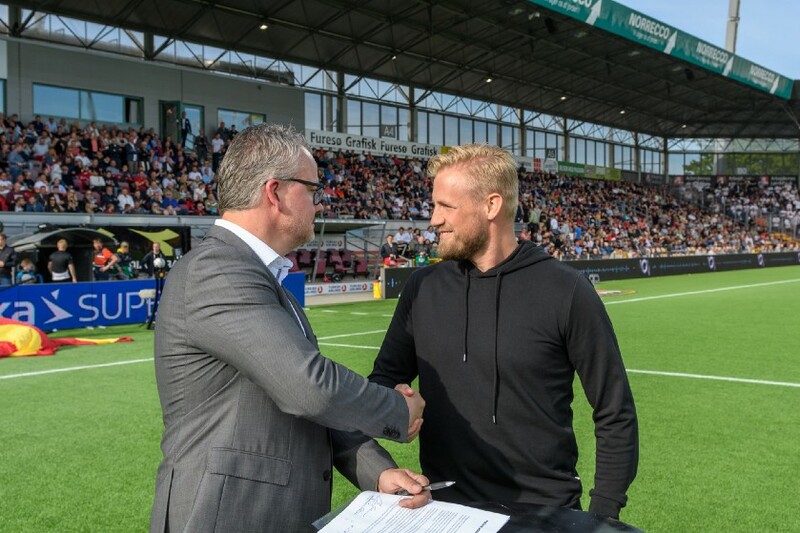 Atli Gregersen plays an integral role for both Common Goal and as captain of the Faroe Islands National Team. And Julian Nagelsmann, one of the most talented young managers in the game, champions Common Goal in Hoffenheim, just down the road from our headquarters in Berlin. These are just a few examples of the incredible collection of football players and managers that are helping to drive this movement. And it’s not just those on the pitch either. The ultimate aim of Common Goal is to unlock 1% of the entire football community’s revenues to benefit football for good organisations. That really does mean everyone: players, managers, clubs, officials, and businesses supporting community-based, football organisations tackling some of the world’s toughest problems. 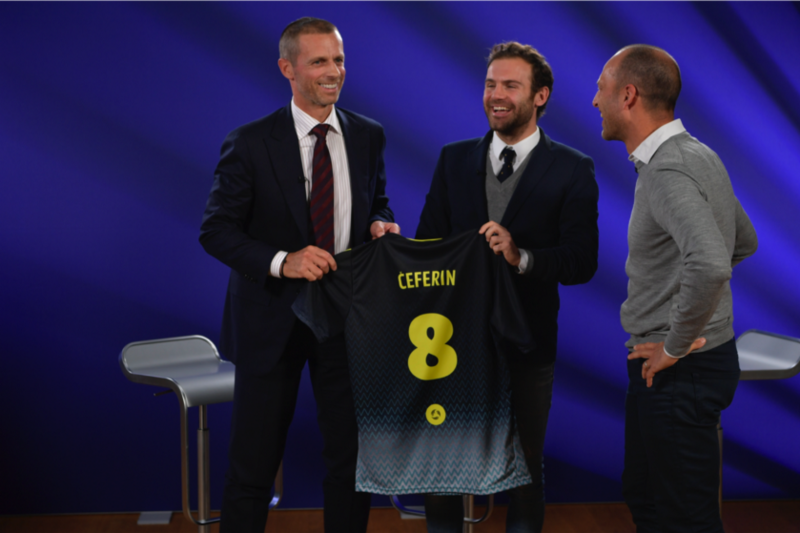 Last November, Juan Mata and Common Goal co-founder Jürgen Griesbeck visited Aleksander Čeferin, president of UEFA, at their headquarters of European football in Switzerland to discuss the President’s personal interest in Common Goal. By the end of the meeting, Čeferin was so impressed that he too took the pledge and joined the Common Goal team as the first football official to do so. Then in May of this year, with the season barely over and the summer transfer market just opening, Common Goal secured one of the window’s biggest signings: Denmark’s own FC Nordsjælland, as they became the first club side to join the movement. 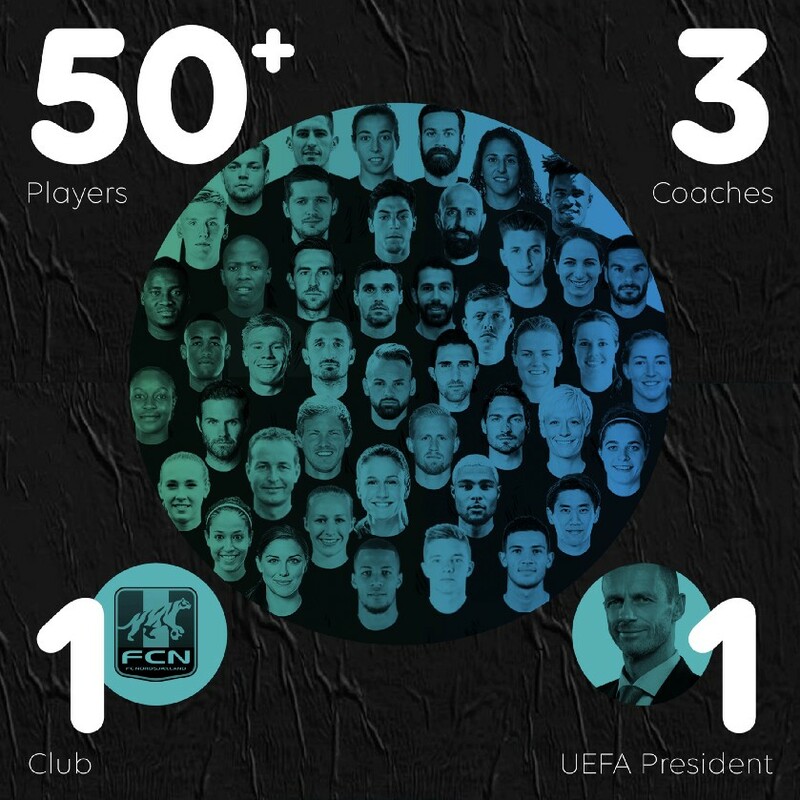 FCN’s historic commitment consists of 1% of their total stadium revenue, along with their 10-member management team taking the pledge, and all future contracts, including club administration, players, and staff containing the 1% commitment (with the ability to “opt-out” if so desired). From the beginning, we have heard from Common Goal fans all over the world that wanted to join the movement. That’s why this summer during the World Cup, along with cheering on our 5 Common Goal players taking part in the tournament, we worked with WeWork and Facebook to give fans the opportunity to support Common Goal. With WeWork, we hosted events in major cities across the globe. Every event was a chance for the team to educate the audience on Common Goal, raise funds, and, of course, watch some football. On Facebook, seven of our players invited fans to “join their teams” by donating to Common Goal using the Facebook Fundraising feature. Each team was raising funds for a social topic that was near and dear to the player’s heart. All in all, it was a massive success, and over $110,000 was raised in support of football for good organisations working for gender equality, social inclusion and access to education. It’s been an amazing year. And we are incredibly humbled to have received the invaluable support of players, managers, brand partners, and, of course, you, the fans. It takes a team to accomplish all that we have this year and we have one that can compete on the highest level. But our work is far from finished! As a global community, we only have 12 years left to achieve the United Nations Global Goals. These challenges need to be tackled on a global scale, and they have very real barriers that we must work together to overcome. In order to get there we need to urgently close both the finance and collaboration gap that is major hurdle in preventing us from solving these problems. Football has the potential to lead in both respects and can set an example for other industries to follow. Common Goal will continue to push forward towards accomplishing these goals. Each player that joins grows the awareness of our mission, influences exponential change, and leads the way to a fairer and more equal world. This fall, we will have our second allocation cycle to team up with additional football for good organisations who are tackling social challenges across the globe. We want to continue to work with brands and institutions, both football and others, to create mechanisms that provide a continual stream of support for the social dimension of the game. And, most importantly, we want to further expand the movement with the fans. Because every one of us has a valuable role to play in building a future in which the world’s favourite sport becomes the world’s greatest catalyst for social change.